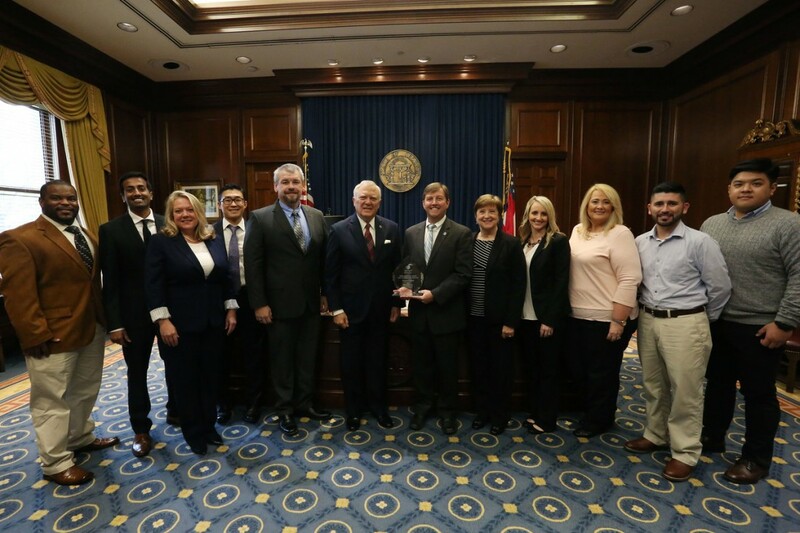 ATLANTA (November 26, 2018) – The Georgia Economic Developers Association recognized the Dalton-Whitfield County Joint Development Authority for an “outstanding achievement in the location/expansion of business in Georgia” at its November Awards luncheon. The Joint Development Authority was recognized for the Hanwha Q-CELLS project that was announced on May 30, 2018. Pat Wilson, Commissioner, Georgia Department of Economic Development, presented the award to Carl Campbell, Executive Director, Dalton-Whitfield County Joint Development Authority, members of Hanwha Q CELLS, along with a number of other Dalton-Whitfield County officials. The Deal of the Year Awards recognizes outstanding achievement in the location or expansion of new businesses in the state of Georgia that meet community economic development goals and involve significant community program support, such as financial or permitting assistance, workforce development, state financial support, etc.